One of the amazing things about studying abroad in Europe is that it makes a wonderful base camp for traveling to other European cities. You’re so close to other countries that you can travel from Barcelona to Madrid or to Marseilles just for the weekend, if you want. Pay attention to travel deals to get the best price on train and plane tickets, and plan ahead by purchasing study abroad insurance for your trips and by making sure that you have any vaccinations and paperwork you’ll need for your journey. Make the most of your semester abroad by traveling to top European destinations like these. London – Not only is London a cosmopolitan city, it’s one where English is spoken everywhere. If you’re studying abroad and aren’t fluent in the language of your host country, this can make such a nice break. Visit attractions like the Tower of London and the Thames Gateway Bridge, as well as hole-in-the walls pubs. Paris – Paris is a must-see destination. Take in the Louvre, the Eiffel Tower and the cafe culture in this European capital. There are so many intriguing museums, churches, markets and neighborhoods to visit, each with their own appeal. 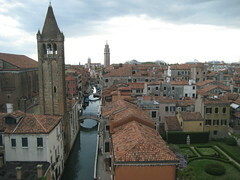 Venice – Venice is a vibrant, romantic city that’s perfect for young travelers. The city is fairly small and easy to navigate. Don’t miss St. Mark’s Square and its beautiful cathedral, the amazing glassblowing shops and the gondola rides. Berlin – At once a lesson in history and a major cultural capital, Berlin makes a great place to visit for a weekend. Take in the nightlife, explore historical relics like the site of the Berlin Wall and the Holocaust Museum, soak in museums and culture and enjoy some fine German pub fare. Lisbon – Getting to Lisbon can be a bit pricey, but once you are there you can live the high life for next to nothing. Portugal’s capital offers perfect bathing beaches, elegant cathedrals and quaint shops. Portugal can get crowded in the summer, but if you travel in the spring you’ll enjoy warm weather and relatively uncluttered beaches. Prague – Cosmopolitan Prague can feel like a fairy tale with beautiful architecture, booming nightlife and Old World charm. Walk over the Charles Bridge, explore the Prague Castle, and don’t miss the town’s Jewish Quarter. Rome – Between the food and the history, Rome offers so many amazing things to do. Visit the Colosseum and the Vatican, enjoy long Italian lunches and explore the bustling nightlife in this Italian city. Istanbul – Half European capital and half Asian metropolis, Istanbul offers delightful food, lively culture, rich history and culture and thriving nightlife. Take a break from the charms of western Europe and experience another world in this city that’s at once modern and classic. Travel with friends or look out for student travel organizations that offer trips to these and other can’t miss destinations around Europe. You’ll have the rest of the week to explore the town or city where you’re studying, and may even be able to meet up with friends from home in other major cities, making memories that last a lifetime. Guest Contributor- Lindsey Harper Mac– Lindsey is a professional writer living in the Indianapolis area. She specializes in writing guest posts on social media and education. Currently, Lindsey is completing work on her master’s degree.